‘The working of woman’s mind has always fascinated me’, says the author Mani Padma. Are they complicated? Sensitive? Twisted? Or just undefinable. In her debut, Mani Padma says her stories are just expressions of the awe and the admiration she has for them. 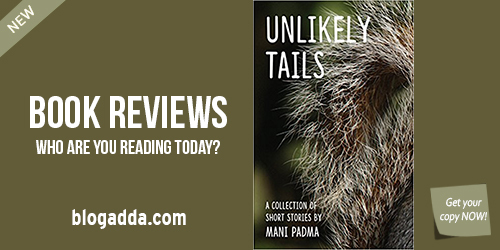 ‘Unlikely Tails’ is a collection of short stories available for reading and review. We have 10 hardcover author signed copies of this wonderful collection of short stories for all the members of the Book Review Program. Apply Immediately if you are interested! How much do you know about women? Do you really know them even when you know them? 17 stories. Various shades. Unexpected revelations. But… the question remains, do you still feel you know them even when you know about them? Manipadma is from Assam, now based in Delhi. She is a full time government doctor, part time mother and a ‘sometime’ punner plus writer. She started writing at the age of four, starting with A B C and is now a full time writer of prescriptions and reports. Her stories and articles have appeared in online magazines and websites, Woman’s Era and in a couple of anthologies. ‘Unlikely Tails’ happens to be her solo debut. She loves to be brief and has a compromised attention span which is the reason she has never attempted a novel but hopes to do so in future if she finds the motivation to do so. can i still apply for this one?